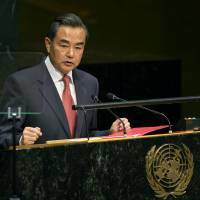 NEW YORK - In a speech at the U.N. General Assembly, Chinese Foreign Minister Wang Yi repeated an assertion that history should not be distorted and aggression should not be denied, an apparent reference to Japan. Next year will mark the 70th anniversary of “the victory of the Chinese people’s war against Japanese aggression,” Beijing’s top diplomat said in the speech Saturday. Last year, Prime Minister Shinzo Abe visited Tokyo’s Yasukuni Shrine, which honors convicted or accused Class-A war criminals from World War II, drawing sharp reactions by China and South Korea and a stronger-than-usual rebuke from the United States. Earlier this year, Abe’s government also re-examined the process of compiling a formal apology issued in 1993 to the “comfort women” from across Asia who were forced to serve in Imperial Japanese military brothels before and during the war. China and South Korea viewed the move as an attempt to rewrite history by questioning the legitimacy of the apology. People who attempt to deny aggression and distort history “will have nowhere to hide,” warned Wang, a former ambassador to Japan. 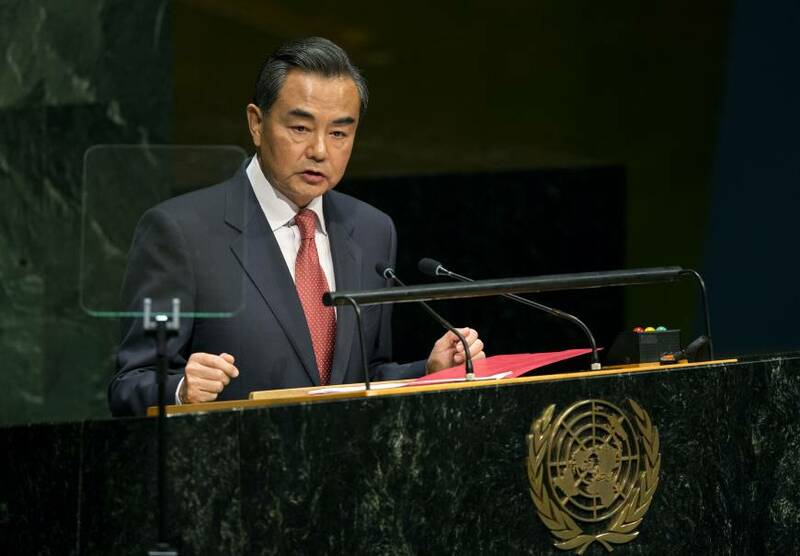 On territorial issues, Wang’s speech was less confrontational than one made at the United Nations in 2012 by his predecessor, Yang Jiechi, who said Japan “stole” the Senkaku Islands from China. Japan and China later traded barbs during the general debate at the U.N. assembly about sovereignty claims over the islets, which Japan administers but China claims and calls Diaoyu in the East China Sea. “The principles of sovereignty and territorial integrity must be upheld,” Wang said Saturday. This apparently was a bid to defend China’s claim to the disputed islands, although Wang refrained from openly pressing Beijing’s case for maritime sovereignty claims in the South China and East China seas, which have raised tensions with Japan and other countries in the region. On North Korea, the pressing task is to restart the six-nation talks on eliminating Pyongyang’s nuclear programs “as soon as possible,” Wang said. China has hosted every round of the talks, which also involve Japan, the two Koreas, the United States and Russia, but the discussions have been stalled since 2008. “The (North) Korean nuclear issue should be dealt with by a sustainable, irreversible and effective dialogue process,” Wang said.